Basically, two scenarios can possibly take place when your loan payment is due. Either a borrower returns to the lender in order to reclaim their check by paying the necessary amount or, alternatively, they allow the lender to cash the check provided before at the time of taking out the loan. The inability to repay leads to another pair of options both of which are quite pricey. When the lender opts for cashing the borrower’s check and there are no sufficient funds on their checking account, the borrower may face extra charges in the form of overdraft fees, a returned check charge, and a late fee (the last one being in effect only in some states). Your lender may also elect a second option which is offering you a renewal of your loan followed by another fee. This choice is known as “rolling over” and, usually, provides you with 2 additional weeks and an extra payment of about $52. If the state law, such as that of Louisiana, prohibits rollovers, the borrower needs to bypass this by taking another loan (as their quantity is unlimited) and repaying with it the previous loan’s full amount. It is easy to see how all the options above can add up promptly, creating a whopping ultimate cost for the borrower. Funding service users should beware of stepping in this vicious circle to not end up with a long-term debt instead of an initial short-term loan, thus meeting with severe financial hardships. These range significantly, depending on the type of a loan; still, most actions taken against persistent defaulters are similar in their harshness. As the National Consumer Law Center informs, 22 states currently permit suspension of state work licenses issued to those who fail to repay their student loan. Just like Texas and Virginia, Louisiana, too, makes use of this law, its extensive list of revocable profession licenses including lawyers, doctors, barbers, social and transportation workers, as well as a dozen of others. Delays in payment of small business typically result in your lender attempting to collect the debt by calling you and sending letters to make you aware of the default. When not getting any proper response, the lender then turns to the collection by their rights provisioned in the SBA loan agreement. What ensues is that some (or all) of the assets put as collateral for the loan will get sold. This practically always includes all available business assets plus any part of the borrower’s real property to discharge the indebtedness. Usually, before resorting to a lawsuit, your creditor themselves will attempt to make you return the money and, if several months do not bring them success, then turn the case over to a collection agency, so that the process will begin anew. It is even possible that the lack of property will render it impossible for the creditor to sue you. As a rule, your debt legally expires in five to six years, which is dictated by the statute of limitations effective in your state (for instance, it goes up to ten or even 15 years in Rhode Island, Kentucky, Ohio, and Louisiana). 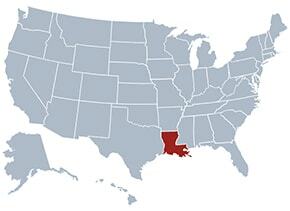 Furthermore, bear in mind that Louisiana also belongs to a set of community property states (along with Arizona, Wisconsin, New Mexico, California, Washington, Nevada, and Idaho) where the very fact of mentioning your spouse’s name in the court judgment could result in garnishing of his/her wages to compensate for your debts.